The Homeless World Cup is an annual football tournament organized by the Homeless World Cup Foundation, a social organization which advocates the end of homelessness through the sport of association football (or soccer). 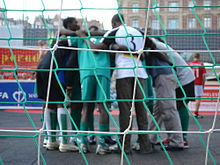 The organization puts together an annual football tournament where teams of homeless people from each country compete. The Homeless World Cup organization was co-founded by Mel Young and Harald Schmied in 2001 to advocate for a global solution to homelessness. The first annual football tournament for homeless people took place in 2003 in Graz, Austria. Host cities since then have included Gothenburg, Edinburgh, Copenhagen, Cape Town, Melbourne, Milan, Rio de Janeiro, Paris, Mexico City, Poznań, Santiago, Amsterdam and Glasgow. The international headquarters of the Homeless World Cup is in Edinburgh, Scotland. The fifteenth edition of the Homeless World Cup took place in Oslo, Norway in 2017. The 2016 champions are Mexico, who won in Glasgow. The Homeless World Cup organization operates through a network of more than 70 national partners around the world, supporting football programs and social enterprise development. Since 2015 the tournament has been played on synthetic turf fields from Act Global. The winning team gets 3 points. The losing team gets zero points. If a match ends in a draw, it is decided by sudden-death penalty shootout and the winning team gets two points and the losing team gets one point. Games are 14 minutes long, in two seven-minute halves. The field measures 22m long x 16m wide. Several TV documentaries have been made tracking the participation of teams from homelessness to participating at the annual event. In 2011, a 90-minute documentary called Hors-Jeu: Carton rouge contre l’exclusion was broadcast by Canal+ and focused on the Paris 2011 Homeless World Cup and Homeless World Cup itself and five national partners: Japan, Argentina, Palestine, France and Kenya. It was aired in France on 9 October 2011. The documentary was directed by Jérôme Mignard and Thomas Risch. The 2006 Homeless World Cup was the subject of a documentary entitled Kicking It. directed by Susan Koch and Jeff Werner focusing on the experiences of seven homeless people at the Homeless World Cup football (soccer) game in South Africa. Featured in the documentary, narrated by actor Colin Farrell were residents of Afghanistan; Kenya; Dublin, Ireland; Charlotte, North Carolina, U.S.; Madrid, Spain and St. Petersburg in Russia. The film premiered in January, 2008 at the Sundance Film Festival, distributed by Liberation Entertainment, Netflix and ESPN. ^ "OSLO 2017" (Website). homelessworldcup.org. Retrieved 7 January 2017. ^ "Mexico win both men's and women's Homeless World Cup". The Guardian. Retrieved 7 January 2017. ^ "Homeless World Cup: More Than a Pitch, a Place to Belong | Act Global". www.actglobal.com. Retrieved 2018-11-05. ^ "Melbourne 2008 Homeless World Cup". homelessworldcup.org. 21 October 2008. Archived from the original (Website) on 22 March 2011. Retrieved 21 October 2008. ^ "The Milan 2009 Homeless World Cup". homelessworldcup.org. 21 October 2009. Archived from the original (Website) on 22 March 2011. Retrieved 21 October 2009. ^ "Bosnian player Alen Hodžić's war-torn road to Chile". homelessworldcup.org. 21 October 2014. Archived from the original (Website) on 29 October 2014. Retrieved 21 October 2014. ^ "Amsterdam 2015" (Website). homelessworldcup.org. 1 September 2015. Retrieved 1 September 2015. ^ "Glasgow 2016" (Website). homelessworldcup.org. 16 July 2016. Retrieved 16 July 2016. ^ "Oslo 2015" (Website). homelessworldcup.org. 1 September 2016. Retrieved 1 September 2016. ^ Palmer, Nancy Doyle (2008-06-01). "Spotlight: Susan Koch". Washingtonian. Retrieved 2009-02-27. Wikimedia Commons has media related to Homeless World Cup.